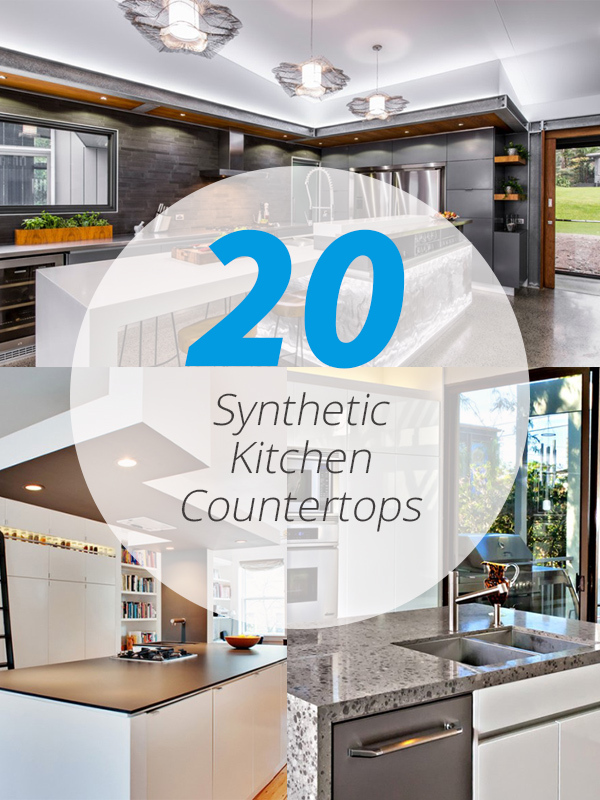 You'll be inspired to upgrade your kitchen with this beautiful synthetic countertops. Are you renovating your kitchen to improve the flow of traffic in your home or to make it look more organized and trendy? One thing that you might consider changing is your kitchen’s countertop. It could be expensive to change it but once you pick the perfect countertop for your usage, you will no longer need to change it from time to time. That is why choosing the material for your countertop is crucial. There are different kinds of countertop materials and today we are going to show you one popular material which is the synthetic countertop. 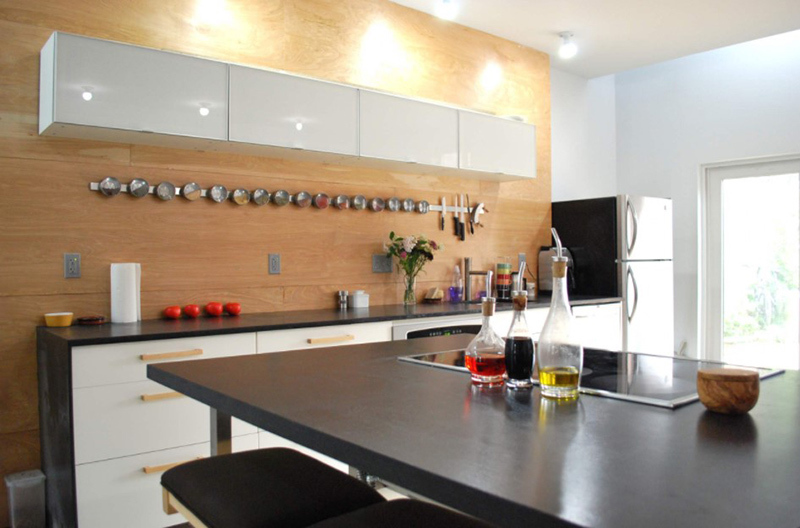 Synthetic or manufactured solid surface countertops are used in many kitchens these days because of its neat look. It can be installed seamless and can even imitate other high-end materials like granite. It is also easy to install without a need to add a plywood underlayment on it. Although it can be vulnerable to heat and dents, it is easy to buff out the scratches. But this kind of countertop is relatively expensive. Below are some kitchens that made use of synthetic countertops so you will have an idea if this will be perfect for your kitchen or not. 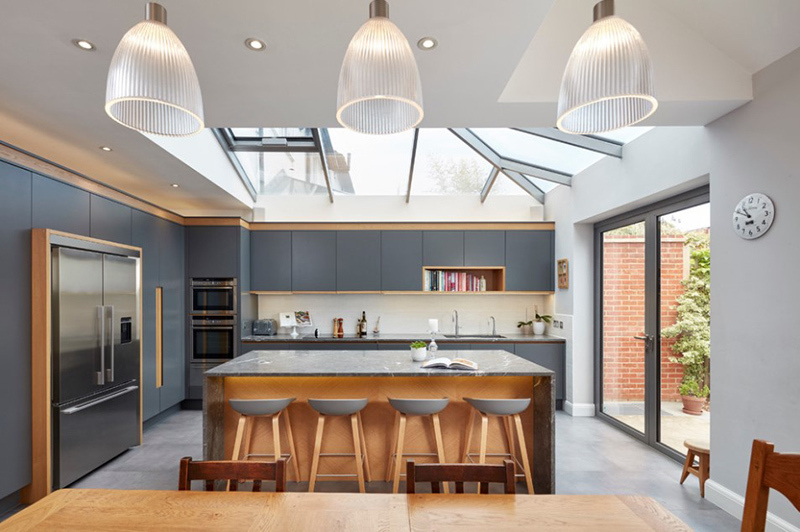 The first thing that will attract us in this kitchen is the skylights. Aside from that, there is also a nice color and contrast of wood and synthetic materials in here. A soft subtle finish of the cabinets gives a distinguished, enduring character to this kitchen that adds an effortless grace to any room. Also used in the area are light oak floors and dark gray countertops. 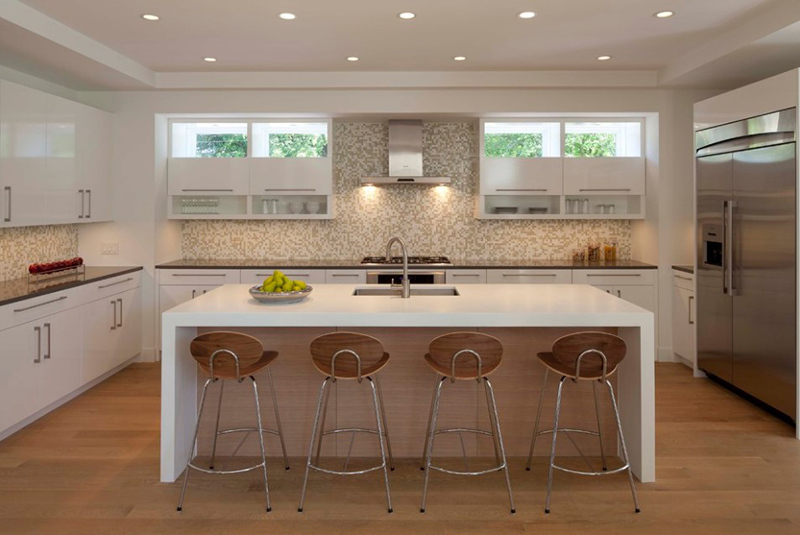 A white synthetic countertop is used for this kitchen and it matches well with the flat-panel cabinets. 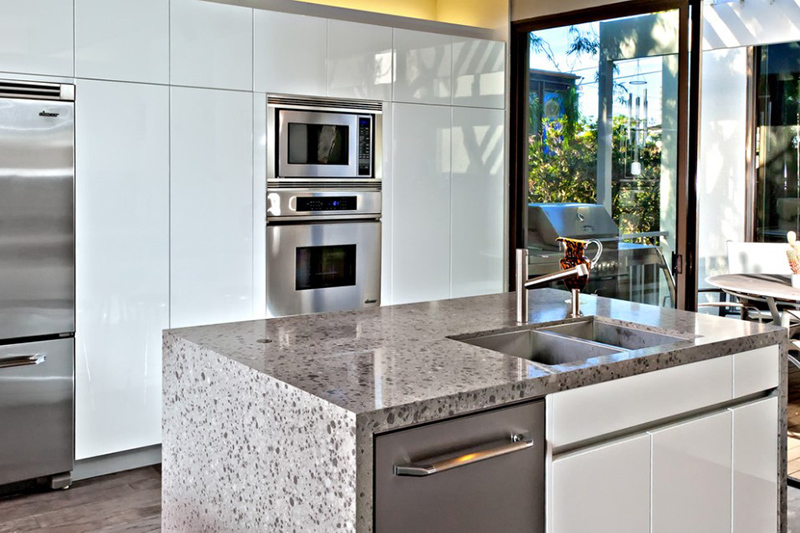 A simple contemporary kitchen with solid surface countertops, gray backsplash, and stainless steel appliances. 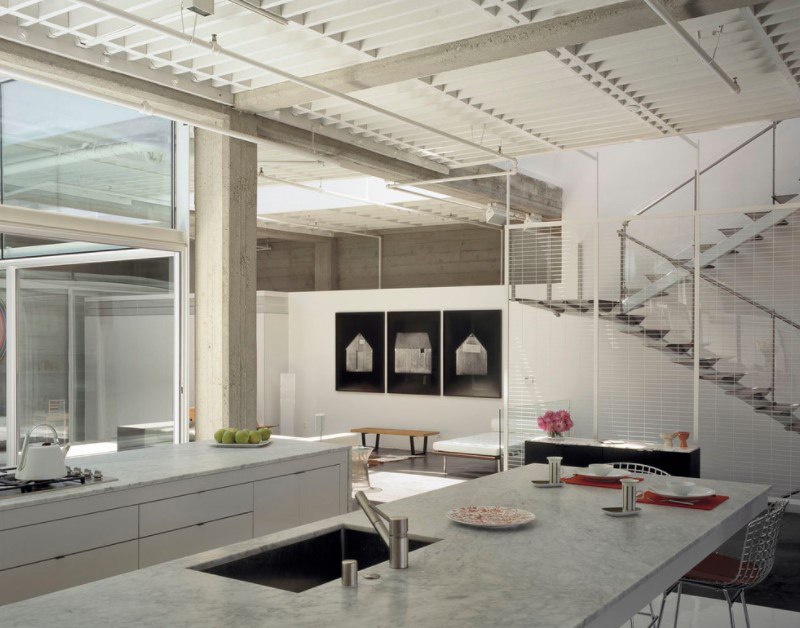 A contemporary kitchen owned by an architect. The designer improved the flow of his new home and maximized storage in a very small space. A Mid-century modern design for this two toned kitchen that captures the feel of the 1950s but with a 21st-century twist. 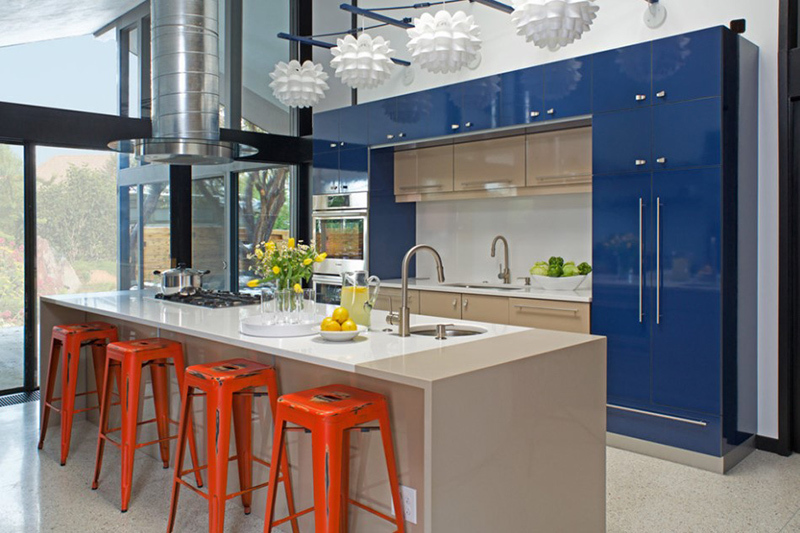 The quartz island top looks beautiful and is a good way to break the colors blue and orange in the space. Isn’t this a nice kitchen? 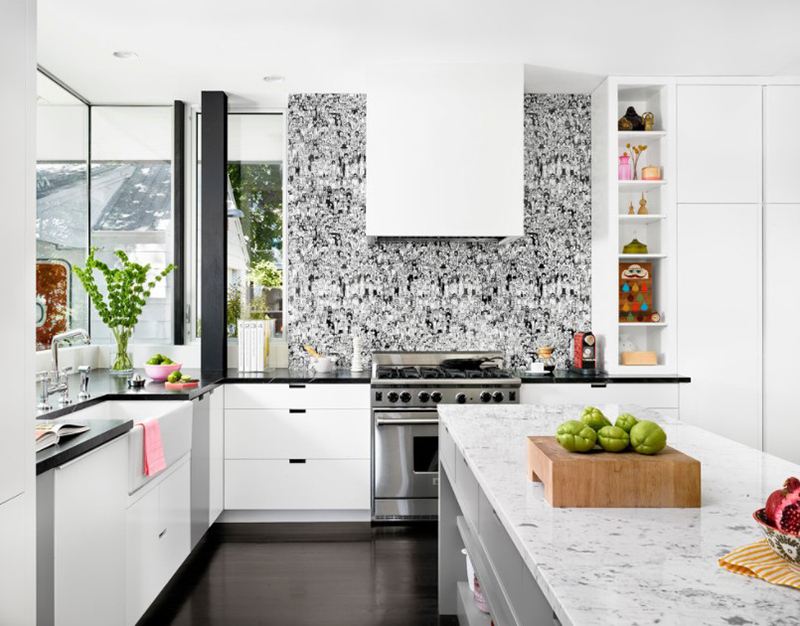 Aside from the wallpaper, I like the combination of colors as well as the quartz super white countertop that brings more contemporary vibe in the area. 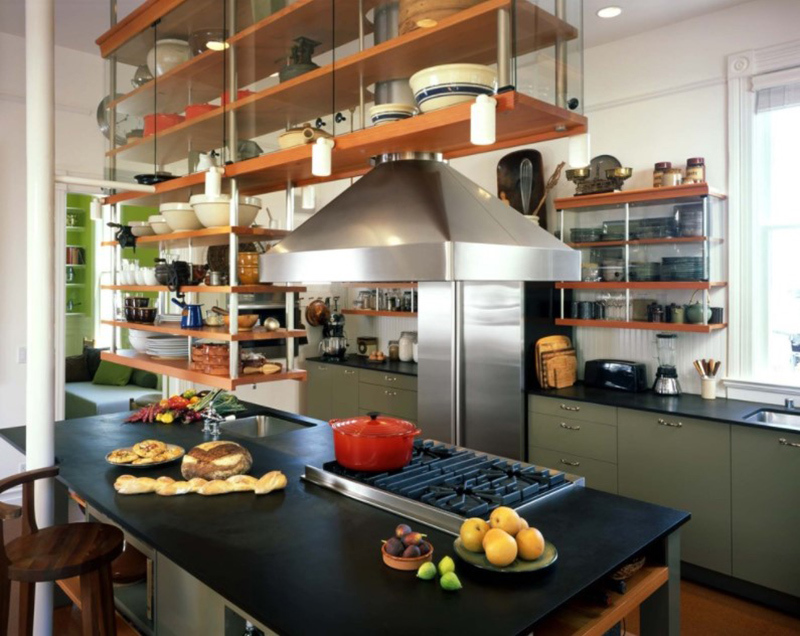 The kitchen island here has suspended shelves above it where some kitchenware can be displayed. A solid surface countertop wins durability and cleanliness like this Corian (composed of a mix of minerals and acrylic resin) used in the kitchen. Because of the material’s flexibility, there are no unsightly joints, and it can be formed to have integrated sinks and draining boards for a neat look. Black countertops are used in this kitchen that matches well with the white cabinets that have natural handles. The spice rack on the wall is very nice too! 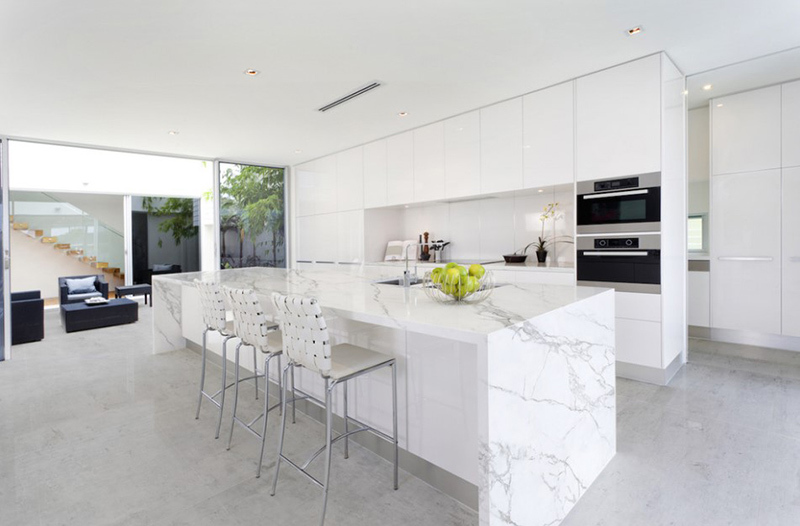 This beautiful white porcelain and engineered quartz countertop is a lovely feature in this galley kitchen. It looks really nice with the white cabinets. This is indeed a stunning kitchen! I love the variety of materials used here especially for the island. According to the designers, it is a metal material that’s interlaced and woven in various ways, then embedded in acrylic. An aluminum channel around the outside to conceals LED strip lights along the perimeter. You will surely love this coastal u-shaped kitchen with black granite counter top with white island. Everything looks beautiful with the dark hardwood floors. 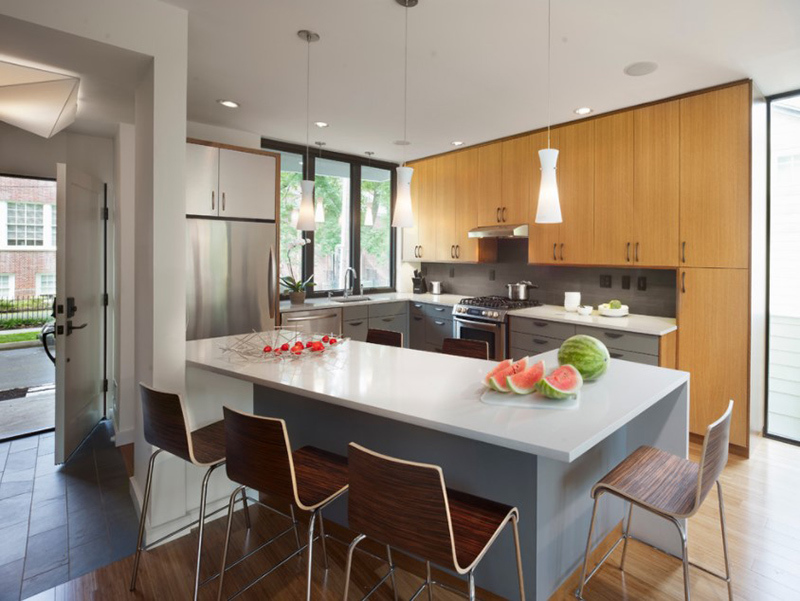 A mid-sized urban galley eat-in kitchen that features an under mount sink, white flat-panel cabinets, marble-like countertops, and gray floors. The walls of this kitchen add an exciting appeal to the space. 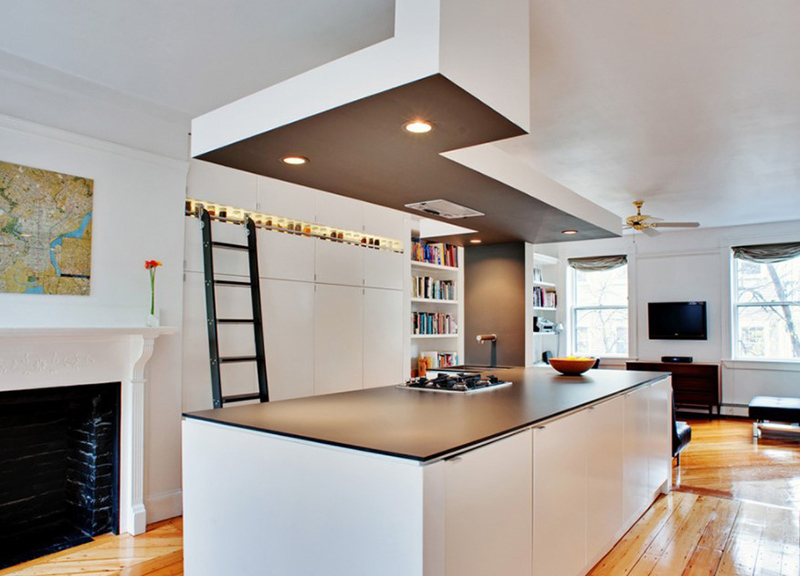 Notice also that the island used white countertops in contrast with the black one used for the cooking area. The solid-surface countertop in this kitchen looks really neat as well as the beautiful caulk wallpaper. This kitchen remodel also features a farmhouse sink, flat-panel cabinets, and white cabinets. A contemporary kitchen with paneled appliances featuring stainless cabinets and a marble-like countertop for the island. 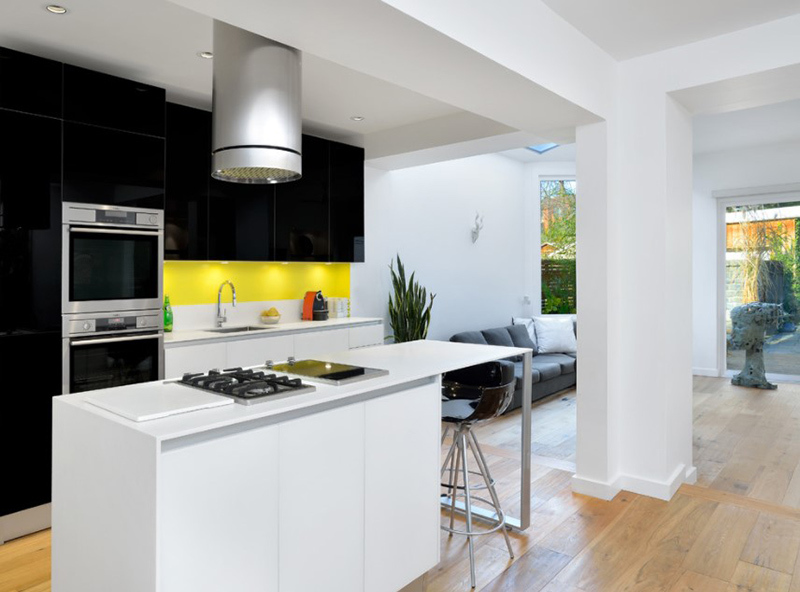 I love the black and yellow combination in the backsplash area as well as how white is added to the space. This kitchen is a renovation project and is part of a major facelift from the multiple layers of past renovations. 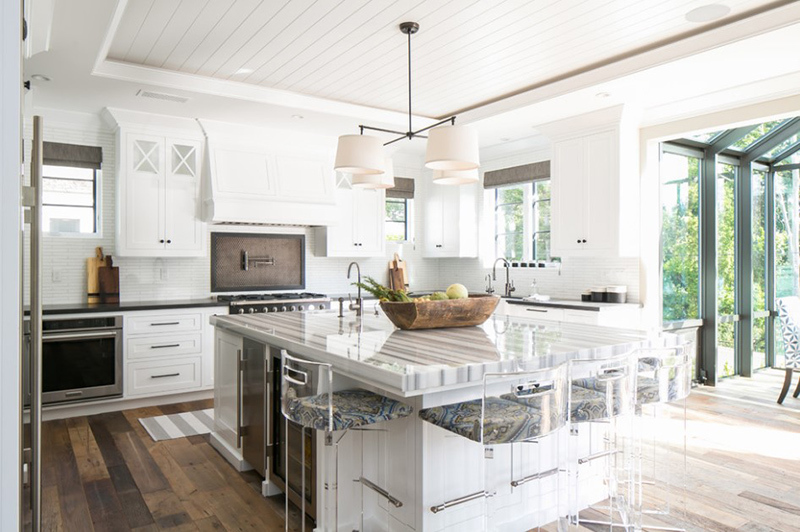 White countertops contrasted with the natural wood and gray floors look really nice in this kitchen. 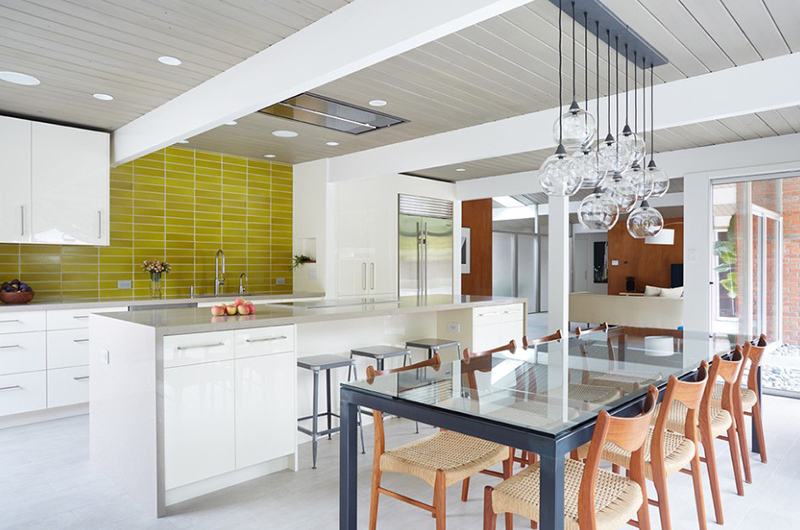 Seen here is a galley open concept kitchen with white cabinets, avocado green backsplash and an island with synthetic countertops. The overall look gives a subtle 70’s feel! 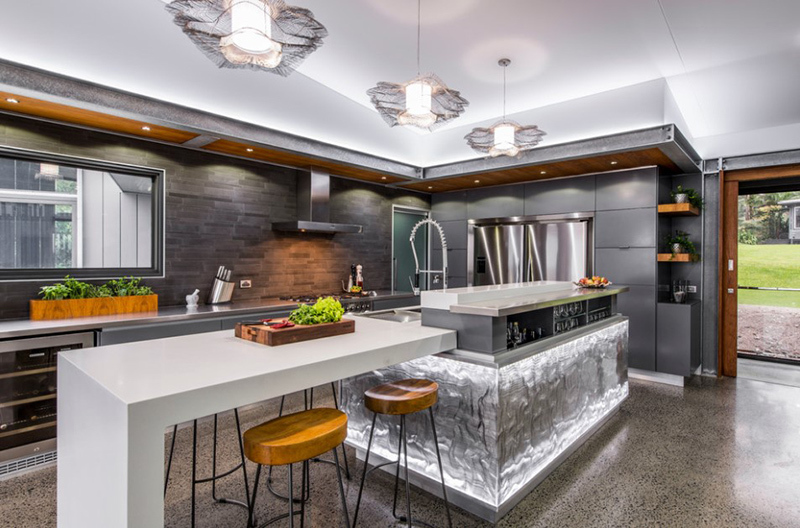 So if you are planning to renovate your kitchen or you are just starting to design your dream house, the above kitchen spaces will surely inspire you. You have seen how a synthetic countertop looks like which will help you decide if you are going to get one or not. It actually depends on your budget and the look you want. But before you decide, make sure that you will not just consider its appeal but how it will affect your work in the kitchen and how long it will last. We have to make sure that everything we purchase is a good value for our money. Now before you read other articles from Home Design Lover, can you tell me which of the above kitchens you love the most? lovely ideas for Kitchen setups. Too bad there were no websites like this when we were designing our kitchen. Our kitchen is very basic. It does not have a counter in the middle like how most kitchens have these days. I don’t need these designs for countertops for we’ve a simple kitchen and there’s no counter like those in the pictures. How I wished if we’ve that kind of kitchen we would install that countertops. Wow! 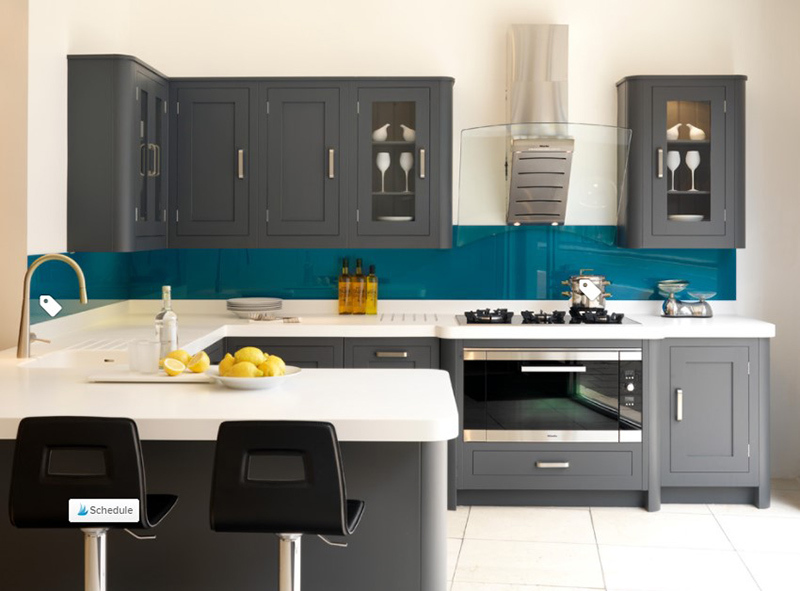 These kitchen’s are beautiful! If only i have home to design, i would choose skrine. So simple and white! I love all your kitchen design of the countertops.. They looks so stylish and added value to our kitchen.. It’s very useful too! I love the design these design will definitely increase the ambiance and beauty of the kitchen. wow. nice design and specially i like mod world.